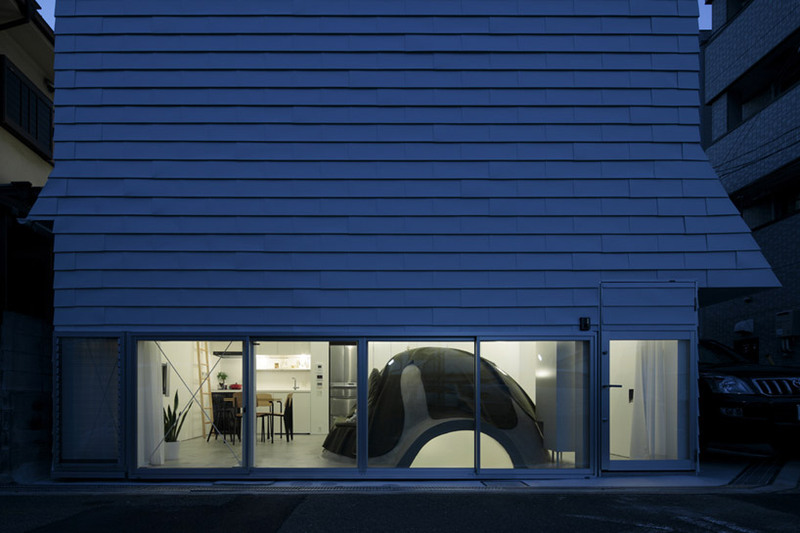 japanese architecture practice SPACESPACE has shared with us images of ‘ground and above roof house’, a two-storey private dwelling in a residential area in ibaraki-shi, osaka, japan. taking note of the site’s open atmosphere, the design features a transparent street facade with a vertically extended communal space that continues the sense of expansiveness to the interior. 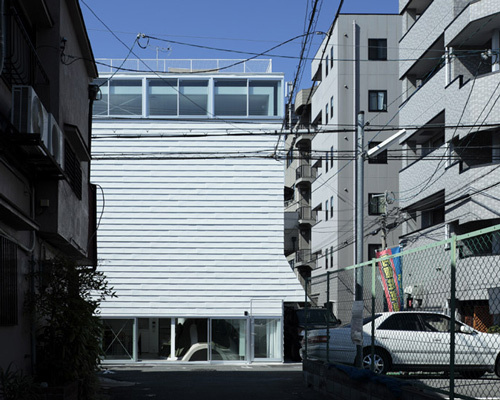 situated on the corner of an intersection in a neighborhood populated with long-term residents, the design aims to maintain a friendly level of communication with the street. in addition, the site is characterized by an unchanged zoning regulation which enabled the architects to build slightly higher than the adjacent structure to the south. taking advantage of this ability, the house stands much taller than a conventional two-storey building, placing its second level above an exceptionally open communal ground floor. serving as a focal point of the ground floor is an artificial hill made out of concrete and wrapped in a cushioned cover similar to those used for sofas. the multifunctional unit provides seating opportunities along one side and a number of pockets for storage around its exterior. a bathroom complete with a bathtub is accommodated within the igloo-like shell and is accessed by a series of small steps. the hill collects solar heat gained from a generous window located at an elevated position on the southward facing elevation. the second storey hosts three bedrooms and a multifunctional central hall. this space serves as a second, more private living space and is intentionally neutral in its program. great attention was paid to passive heating and cooling, allowing the house to operate with minimal energy use. the north and south partitions are constructed as double walls, generating a slim ventilation space that releases abundant heat. the large window on the ground level can be closed by electric blinds, giving the inhabitants full control of the interior condition. I want to live here ! Kamé Sennin ! I want my own Igloo Washroom, immediately. I enjoy this home. Honestly photographed. No super wide angle lens. I would make changes with the turtle hill but love the concept. I think that’s my white T-Bird parked outside.